Well, you can cut them up without cutting them apart. That way you can clean between the leaves, while leaving them together for cutting. It's actually very simple, and once you've seen it you should be able to look your leek in the eye and move on to the next question: what do you want to make with it? 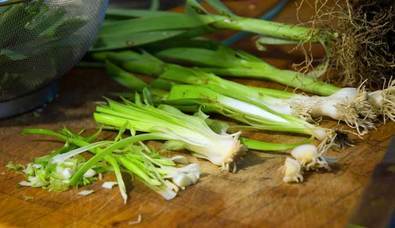 The picture shows a leek as it goes from freshly picked to ready to use. Starting at the back, we have a whole leek, leek with haircut, then trimmed of its greenery, split, washed, julienned, and diced. Slice the leek in half lengthwise. The end with the roots will hold them together. Rinse leek halves under running water, gently separating the leaves to clean between them. Lots of dirt collects between the layers so make sure you wash them thoroughly. 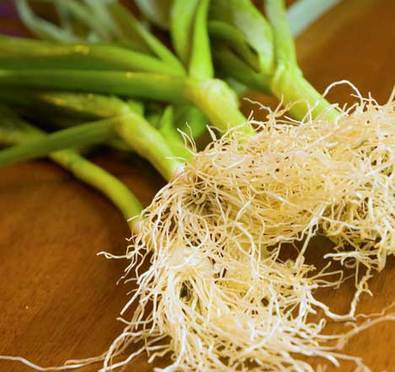 Slicing: If you are cutting into julienne or matchsticks remove the roots first; if slicing in semi-circles, leave roots attached while cutting to help hold the leek together. That's it. Not really intimidating at all, is it? Now I am off to something that is: homemade caviar.